Two products in one convenient package compatible with many popular, super-wide angle DSLR lenses. The injection molded acrylic 8-inch diameter dome is specifically designed for underwater photography to provide superior optical performance. Compared to a smaller 4- or 6-inch diameter dome, the larger diameter reduces edge distortion on pictures taken with certain super-wide angle lenses and makes shooting over-under shots (half-in, half-out of the water) easier. Domes are ideal underwater for shooting wide angle lenses. If you're shooting a macro lens, we recommend using the Modular Glass Flat Front instead. Two products in one convenient package compatible with many popular, super-wide angle DSLR lenses. This kit includes our shortest Modular Lens Extension for lenses up to 2.75 inches (7.0 cm) in length (product number 5510.11), perfect for use with compact, super-wide angle lenses. The extension threads onto the base of the Modular 8-inch Dome for simple assembly. Bayonet-style attachment to the housing body. Works with all newer 4-lock housings as well as all older 2-lock housings. 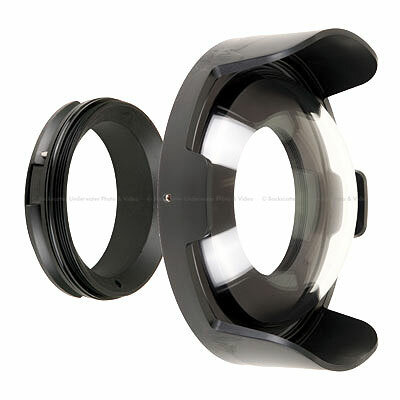 Lens Extensions are available in a variety of lengths to accommodate most popular wide angle and zoom lenses. Additional extensions can be purchased separately and used with this Modular 8-inch Dome.